This project had its start in a late 2009 discussion between Leif Bloomquist, a Canadian Commodore enthusiast and musician, and myself. Leif had been playing with a hand-built 6850-based VIC-20 MIDI cartridge designed off a 1980’s era Maplin “Electronics” article, and wondered if a production run could be arranged. I took a look at the design, and noted that the 6850 UART would be hard to source. I suggested some design changes to bring costs down, and plans were made to refine the design. To further the design, I wired up a newer UART (16450-based) to a daughtercard that could plug into the 6850 socket on the original board. That allowed Leif to refine the software, and provide out the redesign. Once that was done and successful, we discussed a final production version. Changes included offering a built-in user-flashable ROM function. That brings us up to late 2012. I purchased the parts for a completely new prototype board, but could not get it assembled by World of Commodore, so I brought the parts to the show and hired the assembly done. Well, the assembly resource took longer than expected to finish the construction, but I did receive this same exact board mid-Feburary 2013. I fixed a few small design issues, only to discover the board expansion port was wired 100% backwards. Commodore, for reasons known to them only, named the pins on the VIC-20 expansion port in reverse from the industry standard. Since the prototype PCB pins were named according to the standard, every one would need modification. I packaged up the board and sent it back to the assembler, but I must have messed up the address, as it did not arrive in a timely fashion. Since I had shipped it from the Post Office directly, I didn’t get tracking information, and thus had no idea of its location. After a few weeks, I resigned myself to the loss of the unit, and started gathering parts for a second unit to be shipped via trackable shipment to the assembler. As it turns out, the assembler and I were both planning to attend the 2013 Midwest Gaming Classic in WI, so I made plans to transfer a new set of parts during the show. No sooner than the show ended and parts were transferred, the original package showed up at my office, undeliverable. I quickly saw the addressing issue, created a new trackable label with the correct address, and sent it on its way. Which brings us to last week, when the unit arrived, after the rewiring effort. After all of that effort, I could now begin the potentially laborious task of debugging a “paper design”. I had designed the entire unit on paper, but had not previously proven out any of the elements on a breadboard. Though the original UART design was working on Leif’s PCB, the new design was marked different, owing to the additional decoding logic needed for the FLASH ROM. As such, it was almost a completely new design. I’m not sure if credit is deserved and who deserves it, but the UART and FLASH ROM read access worked out of the box. Bank selection for the FLASH ROM did not work, but that’s a minor issue. 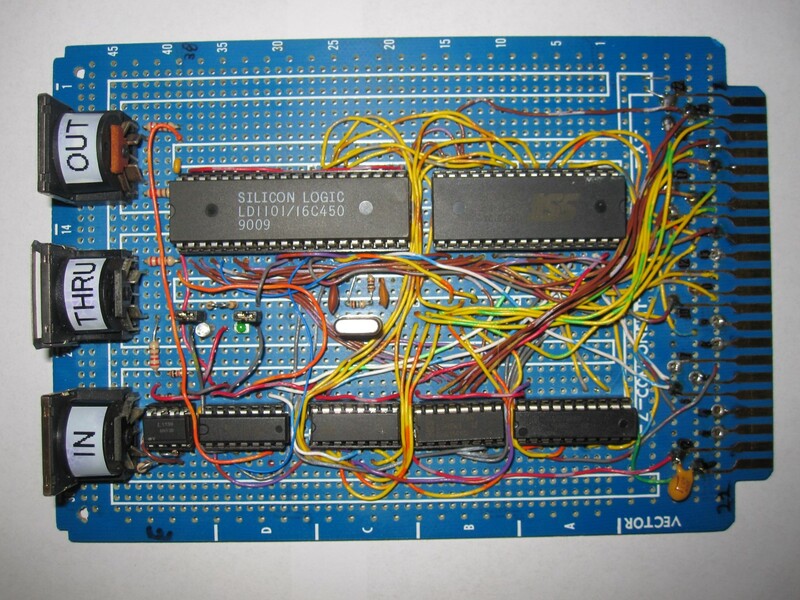 And, we’re almost to the point of creating a VIC-20 MIDI production design.